What is right hand rule? 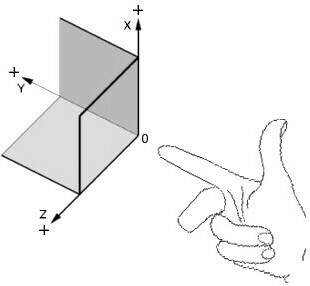 The Right Hand Rule is a quick way to determine the correct positive orientations of the X, Y, and Z axes in relation to each other. To perform the maneuver, a person would first make a fist with their right hand. Then, they would hold that hand straight out in front of them and stick their thumb straight up in the air, point their index finger forward, and point their middle finger to the left (illustration below). At this point, all 3 digits will now be pointing in the (+) positive direction for the X (thumb), Y (index finger), and Z (middle finger) axes. If they then rotate their wrist so that the thumb is parallel with the X axis and the middle finger is “sticking” in the spindle, all 3 digits will be pointing in the positive direction of the axis they represent.